On Halloween, it may seem like a lot of fun dress up and jump out in a scary costume and shout “boo!” to scare our family and friends. That’s because most of us know who’s really underneath it. But it’s different for pets. For example, masks and costumes that make it hard for them to recognize you can cause your cat to panic and run for cover (or streak out the door) or cause your dog to act aggressively to defend himself and his family. Experts say even the most tolerant dog can find this kind of activity stressful, overwhelming, and difficult to comprehend and handle. 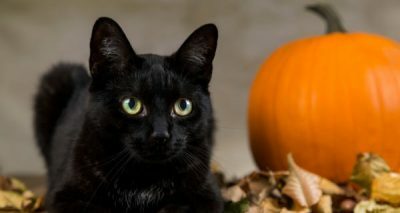 The following ideas from the ASPCA, HSUS, American Veterinary Medical Association (AVMA), and PETA on Halloween pet safety will help ensure the holiday remains enjoyable and safe for all species. Read the entire article at The Farmer’s Almanac.com!